Dan Scripps of Advanced Energy Perspectives, describes the four major trends taking place in renewable energy finance in the US. Green Banks are scaling up, Yieldcos are shaping, green philanthropy is on the rise and energy efficiency investments are picking up. When I originally typed this heading, I put “green banks” in quotation marks. But after years of growth and concrete evidence on which to judge their success, it seems time to eliminate the quotes. Green Banks – public and quasi-public institutions that leverage public and private funds to finance a range of advanced energy projects – are here, and entering 2016, they seem poised for further growth. Starting with the Connecticut Green Bank in 2011, a growing number of states – including California, Hawaii, New Jersey, New York, and Rhode Island – now have some form of green bank, and last spring Nevada enacted legislation to evaluate the benefits of creating a green bank in the Silver State. The Coalition for Green Capital lists at least eight additional states that are considering green banks. This growing movement was capped in December with the creation of the Global Green Bank Network during COP21, which includes the Connecticut New York Green Banks, as well as Australia’s Clean Energy Finance Corporation, the Japanese Green Fund, the Malaysian Green Technology Corp., and the UK Green Investment Bank. In addition, the U.S. Department of Energy issued a report on Energy Investment Partnershipshighlighting the various green bank models and their potential benefits, and the Union of Concerned Scientists published recommendations for using the financing structures typically associated with green banks to assist states in their Clean Power Plan compliance strategies. Perhaps more importantly, green banks are beginning to show real results. Hawaii began accepting applications for financing under its Green Energy Market Securitization (GEMS) program. The California Lending for Energy and Environmental Needs (CLEEN) Center at the California Infrastructure and Economic Development Bank (IBank), did its first financing in November. And Connecticut has seen rapid growth in the utilization of financing instruments to scale the capital available for advanced energy investments. 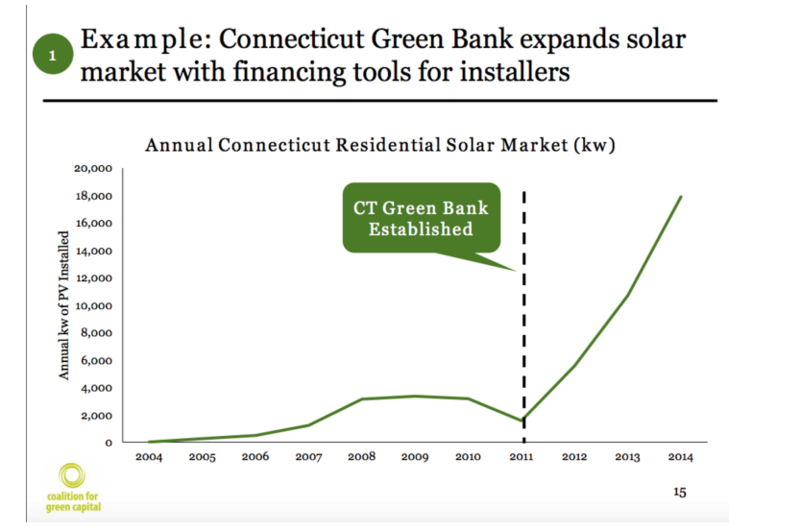 Prior to the establishment of the Connecticut Clean Energy Finance and Investment Authority – renamed Connecticut Green Bank this year – just 9% of the advanced energy funds provided by the Nutmeg State were used for financing. In 2015, that figure rose to 77% – helping to attract and leverage private capital for $365 million in total investment. That’s more than the previous Connecticut grant-making authority invested over its entire 11-year existence! Similarly, the New York Green Bank has now received more than $850 million in proposals for investment of its capital, corresponding to $3.5 billion of potential project value in New York State. The NY Green Bank has now announced two annual rounds of project investments, with a partner organization announcing a third investment last spring. As these investments play out – and other states see the benefits of employing financing strategies to stretch available resources to promote advanced energy – look for state green banks to sprout in the years to come. If 2014 was the year of Great Expectations for yieldcos, which were expected to change the financing landscape for advanced energy projects, 2015 served as the Winter of Our Discontent. Indexes of yieldco stocks lost between 30% and 40% of their value between May and December. Despite a business model based on long-term contracts assuring steady dividends to investors, the market for these investment vehicles has remained jittery at best. So what does 2016 hold for the yieldco market? Let’s call it A Tale of Two Yieldco Markets. For yieldcos with a strong sponsor, 2016 could be the best of times, recovering from the volatility of 2015 and taking advantage of the certainty provided by the extension of the Investment Tax Credit (ITC) and Production Tax Credit (PTC) for growth going forward. 8point3 Energy Partners, for example, which was launched last year as a joint venture between First Solar and SunPower, gained recent praise for “keeping its promises” in respect to anticipated distributions to investors, aided by its rapid ability to get its asset base up and running. That – combined with the extension of the ITC – helped 8point3 Energy Partners jump 32% in December, with some analysts projecting “more market beating performance…coming in 2016.” Others have pointed to independent yieldcos – such as Pattern Energy, Hannon Armstrong Sustainable Infrastructure, and Brookfield Renewable Energy Partners – as potentially being in a stronger position than those under pressure to purchase the assets of their sponsors. For other yieldcos, however, 2016 may continue to be the worst of times. As analyst Tom Konradpoints out, part of the decline in yieldco valuation in 2015 “was due to the realization that many Yieldcos…were not immune to the financial problems at their sponsors, and so they were far more risky than many investors previously thought.” Though the ITC and PTC extensions may help, it’s not clear that that will be enough to generate across-the-board growth for the yieldco sector going forward. What’s clear in all of this is that yieldcos are neither the panacea their boosters claimed they would be, nor the lost cause the market considered them in 2015. Indeed, because of their devaluation last year, a number of analysts suggest that the asset class is ripe with overlooked (and undervalued) investment opportunities. In other words, the yieldco story is not yet over. Indeed, it’s shaping up to be an Odyssey. One of the big developments of 2015 was the growth of philanthropic capital, with advanced energy among the potential beneficiaries. In January, Bloomberg Philanthropies and the Heising-Simons Foundation jointly announced a gift of $48 million to reduce carbon and accelerate the transition to advanced energy at the state level, though this money will go to state-level stakeholders and technical assistance rather than deployment. This was followed in June by the White House’s announcement of a new Clean Energy Investment Center focused in part on scaling mission-related investments (MRIs) from family offices and charitable foundations to the tune of $4 billion. Then came the publication in September of new guidance from the U.S. Department of the Treasury on mission-driven investments. Specifically, the new Treasury guidance states that “a private foundation will not be subject to tax under section 4944 if foundation managers who have exercised ordinary business care and prudence make an investment that furthers the foundations’ charitable purposes at an expected rate of return that is less than what the foundation might obtain from an investment that is unrelated to its charitable purposes.” In other words, a foundation can choose to put its endowment money into an investment with a lower rate of return if that investment also helps further the foundation’s charitable objectives. This guidance, as well as the support from DOE through the Clean Energy Investment Center and the establishment of new investment vehicles focused on the advanced energy sector – including the creation of the Breakthrough Energy Coalition, a new multi-billion energy innovation fund announced by Bill Gates and others on the eve of the Paris climate talks – provide both more clarity and more opportunity for impact investors to put their money into advanced energy in 2016 and beyond. For 2016, all signs point to continued growth in this market. Hannon Armstrong closed out last year by announcing it would provide up to $100 million in financing through the Connecticut Green Bank’s Commercial PACE program, and new data from the Urban Institute demonstrates that financing energy improvements through residential PACE improves the resale value of the home by up to $9,000 over comparable homes without PACE-financed improvements, taking into consideration the financing costs. As the authors note, “this is the first study to determine not just whether the energy renovations added value to a home, but whether the value of the home energy renovation exceeds or falls short of its financing cost.” In both residential and commercial markets, PACE continues to gain momentum. This article was first published on the blog of Advanced Energy Economy (AEE), a national association of business leaders in the US who aim to make the global energy system more secure, clean, and affordable. They are active in energy efficiency, demand response, natural gas electric generation, solar, wind, hydro, nuclear, electric vehicles, biofuels and smart grid. Republished with permission. Great! Renewable energy helps our environment in such a way that i t could minimize the carbon footprint, wind, solar, geothermal, hydroelectric, and biomass provides substantial benefits for our climate, our health, and our economy.